Written by Catherine Saxelby on Thursday, 16 November 2017. If something says “All Natural” or "No Artificial Colours and Preservatives” does that mean it’s good for you? Not necessarily, it could just be clever advertising LabelSpeak. Do you know how to tell? 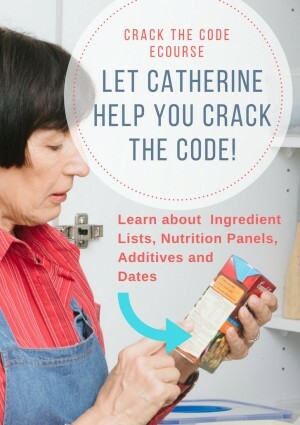 I’ve had so many questions about labels and the various claims, ingredient lists, nutrition panels, additives and dates on them that I’ve developed an eCourse called Crack the Code to help you educate yourself on the things you really need to know and, also, how to recognise LabelSpeak and read “between the lines”. Easy exercises to test yourself. Plus you’ll get free extra Cheat Sheets to take with you when shopping. You can work through the six lessons all at once or at your own pace. Ideally I suggest one or two a week over three weeks to allow time for it all to "sink in" and for you to check out food labels in your own kitchen. And when out shopping. I’m Catherine Saxelby, a university-qualified dietitian and nutritionist of over 25 years. I understand the ins and outs of food, diets and nutrition. I’ve taught hundreds of people - adults and teens - how to de-code food labels and learn the most from the food label. Join me! I’m an author of over 2000 articles and 10 books covering just about every aspect of healthy eating, super foods and the latest diets. My books include best selling titles such as Nutrition for Life and the Food and Nutrition Companion. I also run this nutrition website Foodwatch where I help busy people to eat better and manage their weight, if they need to. I'm a go-to person for food writers such as Richard Cornish on labelling and food tech as you can see in his latest article for the Good Food Guide on What's really in your food. Let me help you Crack the Code! I've spent a life time deciphering food labels and now it's time to share the secrets. You don’t need a degree in nutrition or food technology. You just need the right information to crack the food code yourself. You'll become a pro at spotting the marketing hype. You'll find how it can be verified when you see "organic" or "light" or "high in fibre" or "70% wholegrains"or similar claims on thefront of a food pack. There is a wealth of information on a food label as long as you know how to interpret it. It’s like a secret code. You just need a way to CRACK THE CODE. Take the next step and enrol in my online eCourse - Crack the Code! For only A$49 (US$37), you can become a label expert. You’ll never be mislead by LabelSpeak again; you’ll be able to make informed decisions on which food is best for you and/or your family and avoid those that contain additives or ingredients which may cause harm or allergic reactions. Enrol now! Q. What do 'no preservatives, no artificial colours and no artificial flavours' really mean? Q. Why do food companies have to use additives? And how many are there? 48 shades of hidden sugars!